My name is Alicia Magistro and I recently began researching my family history. My grandmother never talked much about her family when she was alive and I am truly kicking myself that I didn't think to ask her more before she passed 8 years ago. I have been trying to piece the puzzles together for the past year or so. This brings me to why I am e-mailing you. I was looking at my Grandmother's sister's death certificate tonight and saw that she was diagnosed with Pulmonary Tuberculosis for 5 years before dying in 1941 at the age of 20. I decided to google what treatment and life for someone with this in the 30s and 40s was and came upon the concept of a Sanatorium. My grandmother and her family lived in Johnstown, PA, so I did a quick search to see if there was a Sanatorium in the area and stumbled upon your website. After some looking around at all the amazing pictures you feature on your site, I had a funny feeling like something looked familiar. I went back and looked at the only photo I have of my Grandmother's sister and I couldn't believe the similarities in the building that she was standing in front of compared to the buildings in your pictures. The picture is above. I've also attached her death certificate. I guess I am just curious on your opinion of the building since you were there! 1. Anna, on the right, with three of her friends. 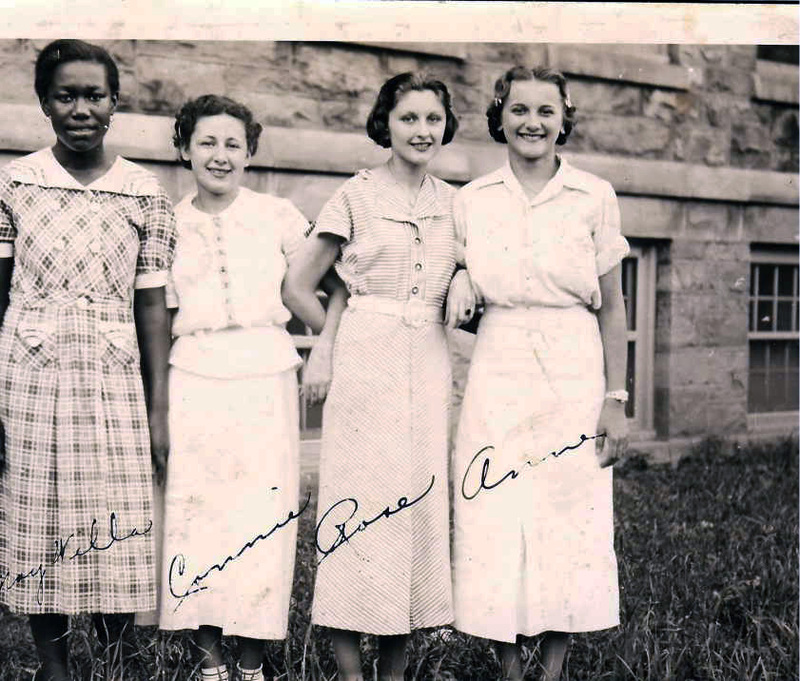 The photo is definitely taken at Cresson San likely in front of the East Wing Women's Ward. Note that all four women are in their street clothes and therefore are "on meals" and presumably would soon be discharged. 2. 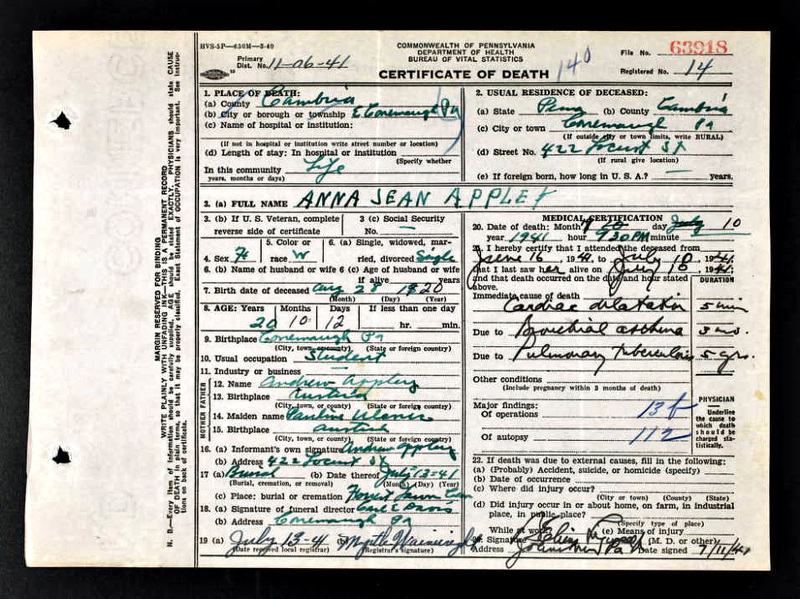 Anna's Death Certificate shows that she died at her parents home in East Conemaugh, Pa. on July 10, 1941. Cause of death was cardiac dilatation, with bronchial asthma and pulmonary tuberculosis being contributing factors. Cardiac dilatation is an increase in the size of the cavities of the heart (enlarged heart) with thinning of its walls. Obstruction of the pulmonary vessels due to chronic bronchitis and tuberculosis can give rise to this condition. When was the photo taken? we can't say for sure, but we can pin it down to a likely time. We know Anna died in July 1941. We also know the immediate cause of death was cardiac dilatation due to bronchial asthma and TB. The TB duration is given as 5 years which means she was first diagnosed with TB in 1936 which is likely when she was sent to Cresson San at 16 years of age. I checked the April 1940 census taken at the San which lists all the patients and staff and Anna is not listed. So she was at the San from 1936 to no later than April 1940. So we can assume that she was cured and discharged from the San and later died at home.